Where did Friday go? Ever have one of those weeks? This has been one. I love fall. I love back to school-not because my kids go back to school, but because it is the beginning of a new year: new calendar; new schedules; new plans… However, it takes a a bit to get used to it all and to get all my systems in place. My planner helps, in fact I couldn’t survive without it. It keeps me focused. I can also trust my planner when I can’t trust my brain! I currently home-school one of my daughters. I strive to live my priorities God, family, then work. I have been privileged to have the opportunity to stay at home. When my girls entered middle school I began working towards developing opportunities to earn some income, while still keeping my priorities. For a brief period I actually went back to work outside the home, working for someone else. The discontent was overwhelming-not just for me, but for my family. It became clear I needed to be back home, where God had called me years earlier. I had to quit comparing myself to others. I had to quit wondering why I couldn’t “do it all” like some of my friends and acquaintances. That’s not what it was about. It was about God’s call for me. What my life looks like is and will be different from that of others. I can’t explain it. I don’t always understand it. That’s o.k. God has plans. His plans are often not in accordance with our ways. It is not for me to understand, it is just for me to obey. That being said, I am back at home. I have begun an organizing business with one of my best friends and recently Mary & Martha found me, I am an independent consultant. I have my real estate license, but am not sure where that will go or how long I will keep that. Managing our home, home-schooling, working in ministry through the Christian Women’s Job Corps and the Women’s Missionary Union, and juggling these income opportunities is challenging. I was really struggling with keeping information at my fingertips. I love binders, and for a while each project had a binder. Problem was, I was frequently out or away from my office space and needed to be able to access some information. 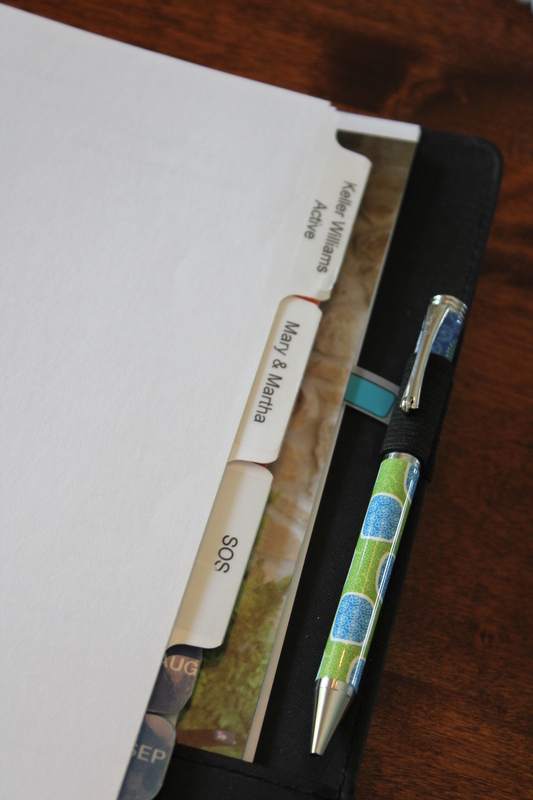 As I began to build my new planner using Life is Crafted products I decided to add some business pages in the back. I have a tab for each business. Behind each tab I keep a running Master To Do list. I write down things I need to do to develop the business. I can then determine week to week whether or not I have time to work on those tasks or just address the immediate clients/tasks. Next, I have a set of monthly tabs. I keep client intake sheets for my organizing business, hostess information for Mary & Martha, monthly promo sheets for Mary & Martha and any listing or selling agreements/info for my real estate. I am in process of locating a monthly budget sheet that will help me track income and expenses for the three businesses. I still keep separate binders for each business, but this allows me to have important data at my fingertips at all times (client names, contact info, listing info…). 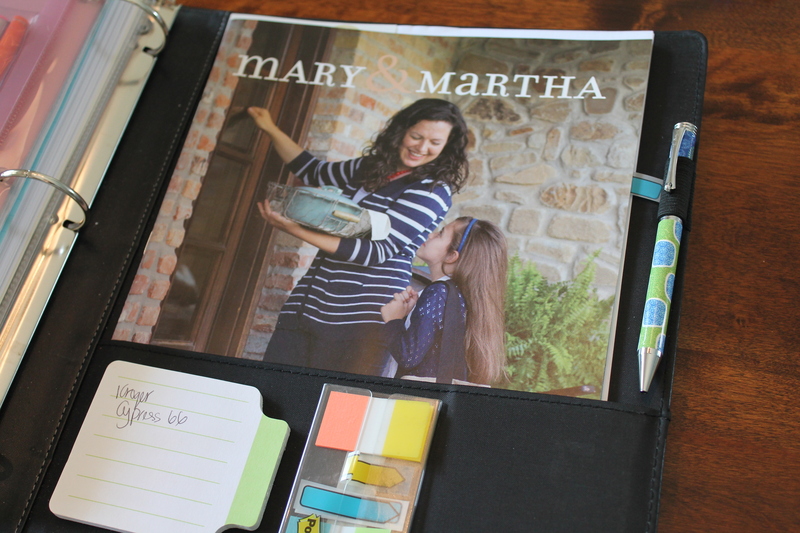 The back pocket of the binder holds the current Mary & Martha catalog and brochures for my organizing business, Simplified- Organized- Styled (SOS). I also keep post-it notes so I can flag items in my calendar, make notes, flag favorites/corrections in the catalog. 1. My ways are not His ways. I can never quit listening. I listen best as I pray each morning over my plans. 3. Obedience to His calling gives peace. 4. I can NOT do it all. Life is a marathon, not a sprint. Today is about today. Live well today and tomorrow holds opportunity. 5. My planner is meant to guide me, not control me or confine me.